We provide staff member and manufacturing solutions based on our global framework. We lavish a high level of attention on even the finest details to train staff members who firmly understand our customers' manufacturing requirements. The staff members dispatched to our clients can work without undue worries because of the permanent employment system they are part of that is run by nms. We have a workplace environment that incorporates a unique career plan and mental care to foster willingness to work along with fully prepared boarding facilities. Full utilization of our unique recruiting site and free papers from all over Japan.We place emphasis on interviews in order to secure highly skilled staff members. We facilitate a social insurance, pension plan, paid holiday system, etc. and regularly conduct health checkups.The ideal working place for employees is offered. 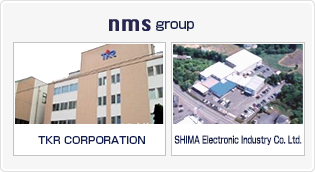 Working with group EMS companies, nms further improves manufacturing ability. Through the utilization of our networks in Japan and abroad, we can offer manufacturing contracts that suit customers’ requirements including for production efficiency and planning. Since nms was founded, it has been attempting to hand down traditional Japanese "manufacturing culture" with a high level of attention paid to even the finest details. Creating manufacturing contracts before other companies in the industry, we have been improving it in the best way we can. Our work contracts differ from those offered by other dispatch agencies because we work with group EMS companies that regularly manufacture a range of electronic equipment.We offer high quality services by utilizing know-how that has been amassed through the carrying out of actual manufacturing processes related to the manufacturing contract business within the group. We have an outstanding level of intelligibility and proficiency in production management and quality control. We can offer ideas to improve production efficiency. We can construct highly efficiency lines, including automatic inspection devices. Shift from manufacturing that depends on hiring temporary workers to a manufacturing framework that incorporates “work contracts”. We also offer ideas to change plans. The most suitable plan changes in association with customer's strategies and objectives.nms offers an efficient manufacturing framework that suits customers' plans and challenges.Smooth migration from a dispatching framework to a work contract framework is also possible. Offer the most suitable plan for work contracts through "Process Analysis Service"
This is a service where we provide consultations or reply to questions regarding shifting to a work contract system.We conduct interviews to learn about your challenges, solutions, time schedules, and ways to handle government-related issues when shifting to work contracts at customers’ sites, and generate reports. We offer a concrete method to shift to the work contract system. 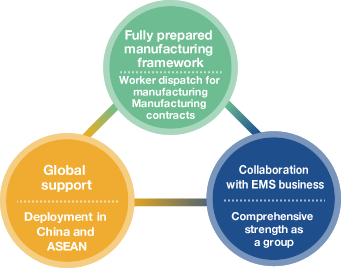 nms can deploy services that integrate highly skilled human resources and high level manufacturing ability in Japan as well as in other countries. Dispatch/work contract framework utilizing global networks. 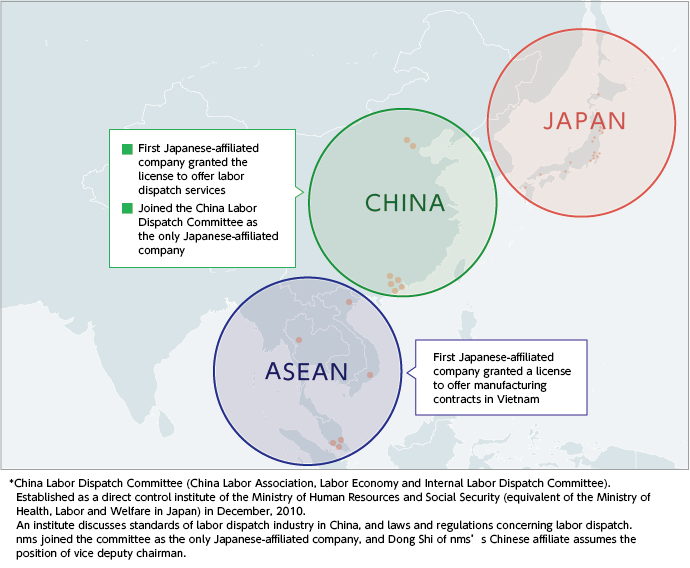 We can deploy "Worker dispatch for manufacturing" and "Manufacturing contracts" in cooperation with each site in Japan, China, and ASEAN countries. Manufacturing processes linking Japan with overseas countries can be established. Facilitate framework in accordance with the legal structure of each country. We have acquired various standards required for manufacturing in specialty areas. We have acquired various standards related to manufacturing in areas requiring high technical capabilities and expertise, including the aerospace business and motor vehicle industry. We facilitate frameworks in accordance with the legal structure of each country. nms group supports Japanese legal structures as well as those of China and ASEAN countries.We facilitate a compliance and appropriate employment management framework to provide high level work contracts.